As May wanes, we sadly must say adieu to our May Leading Lady, Yoonsun Hur. I know I am not alone in being awed and inspired by each week's post by Yoonsun that displayed amazing balance, design, artistry, skill and use of color. I am so thankful to have had Yoonsun share her magnificent talents with us this month! If you missed her smashing debut you must see it...CLICK HERE or her sensational performance with a sweet and stunning background CLICK HERE or if you missed her triumphant performance with an adorable and pretty card CLICK HERE. Hello and thanks again for talking with me today (May is almost gone, Phew~ time really flies)! 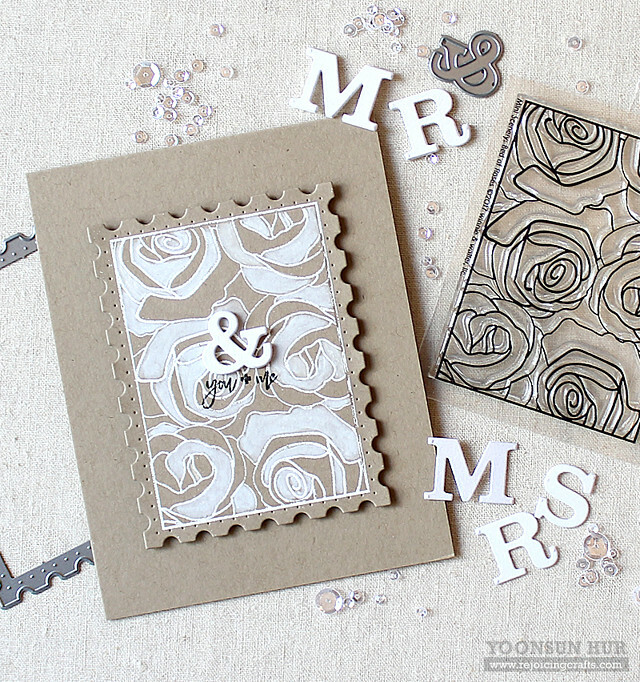 Today I want to share with you my simple (white on kraft) wedding card using the Mini Scenery: Bedof Roses Stamp Set and the Typecast: Cary Numbers Cutaways. I started by heat embossing rose images from the Mini Scenery: Bed of Roses set on kraft card stock in white. I then trimmed it down with the Essentials: Lana Cutaways. I then partially coloured the stamped image with white polychromos pencil. I die cut “&” from white card stock using the Typecast: Cary Numbers Cutaways five times, and then stacked them up using fine tip glue pen – I made it thicker like chipboard. Lastly, I mounted the rose background panel on an A2 sized top-folded kraft card base using foam tape first, added white ampersand die cut using fine tip glue pen, and then stamped the “you + me” sentiment (from the Sentimental:Love set) in black pigment ink. Big thanks for being with me during May! Have a fabulous weekend!! Gorgeous card! Love the Bed of Roses stamp! It's beautiful! I love the effect of white on kraft. I never think to use that combo and I should!!! 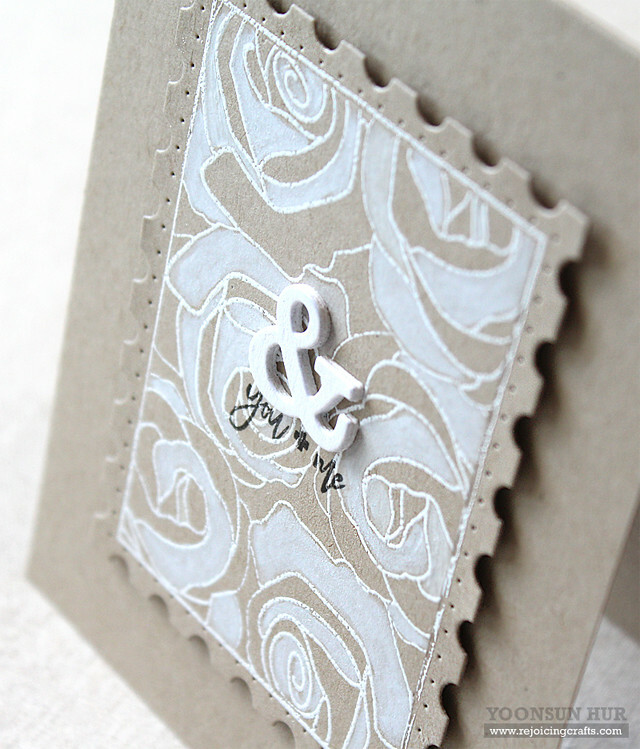 This is especially lovely as a wedding card with the Bed of Roses stamp. I didn't realize that mini-scenery stamp would fit so perfectly inside the Lana Cutaways die. So excited to see that. More things on my wishlist!!! Thank you for all the inspiration you have given us this month!!! Wow!! Beautiful. Love the color combo, so classy. Very elegant! Love this card! Just beautiful. I love your style. I wouldn't have known which sections to color white to make it look good. You're so naturally talented. Thanks for sharing such beautiful works. And these stamps and dies are amazing! My wishlist is growing! 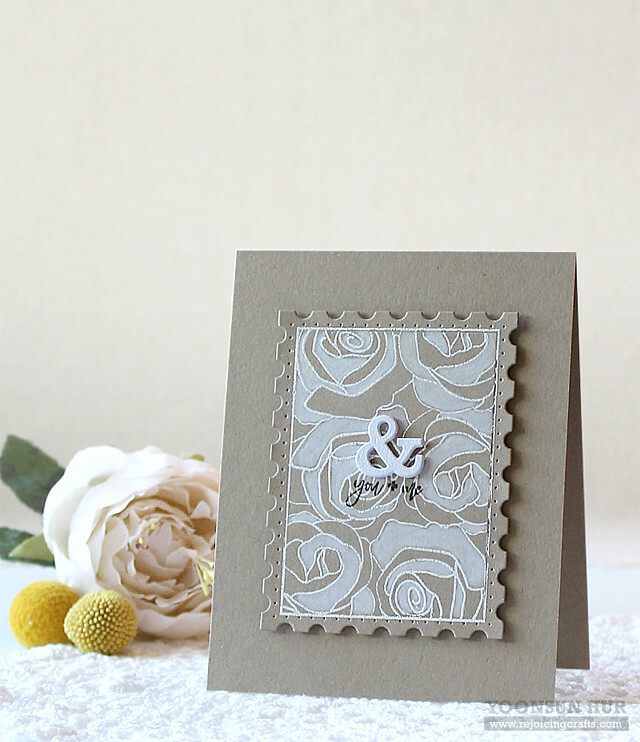 This elegant card is perfectly designed, with the rose stamp taking center stage. I would never think of using kraft and white for a wedding card but the results are gorgeous! I love the stamp you used here - beautiful! Will have to put that on my W&W wish list. Your card is so very elegant. I love white on kraft - probably my very favorite combo. Simply stunning! There's just something about kraft paper! Wow! This is so elegant! Love it! What a lovely wedding card design. 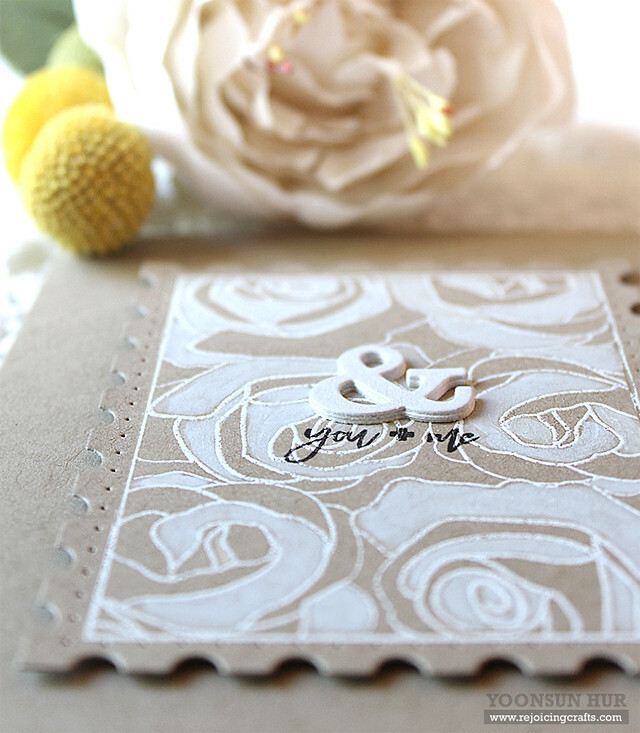 Gorgeous card, I love that background pattern you created! I haven't used the roses stamp yet & really want to--thanks for the inspiration! You've been a wonderful Leading Lady, Yoonsun! I love the simplicity of this card! Really gorgeous -- and with craft paper and white ink. Thanks for the inspiration.